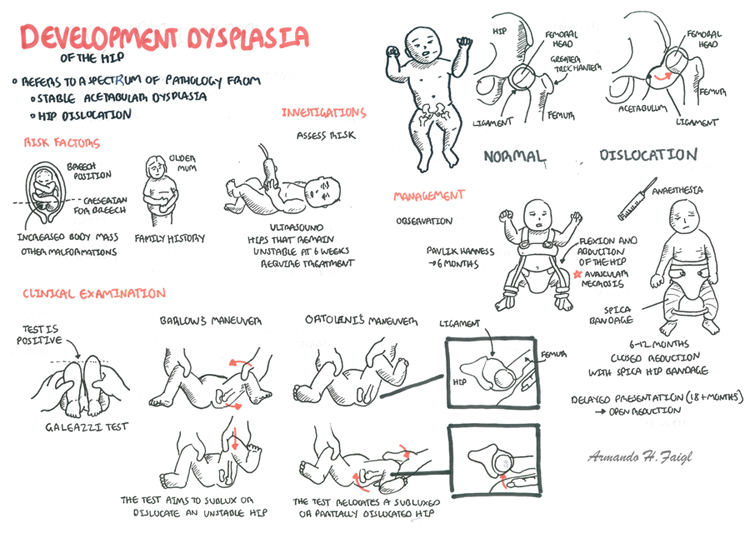 Developmental Hip Dysplasia (DDH): Spectrum of hip abnormality after birth. 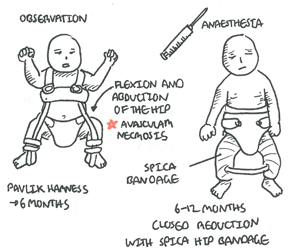 It has replaced congenital dislocation of the hip because it more accurately reflects the full spectrum of abnormalities that affect the immature hip. DDH can predispose a child to premature degenerative changes and painful arthritis. A fibrocartilaginous ring called the acetabular labrum deepens the acetabulum. The head of the femur i covered with hylane cartilage except for fovea capitis which serves as attachment for ligamentum teres. Examiner places fingers laterally over the greater trochanter or hip joint. Remember Ultrasonography should be ordered for infants six weeks to six months of age to clarify a clinical finding suggestive of DDH, assess a high-risk infant, and monitor DDH as it is observed or treated. Management Goal of treatment in DDH is to achieve and maintain reduction of the femoral head in the true acetabulum by closed or open means. The earlier treatment is initiated, the greater the success and the lower the incidence of residual dysplasia and long-term complications. Prognosis is dependent upon the age at presentation, the extent of treatment needed, and the occurrence of complications.